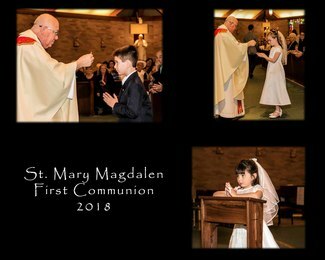 Our photographer, Bud Keegan, will take photos of the children on First Communion day, but he is also making himself available for formal photos prior to the sacrament. If this signup fills up quickly, he is also willing to add a second evening - just be aware that with where Easter falls this year, it will be during Easter break! Just let me know if you are interested! There is no cost for the sitting, he will take whatever photos you like that evening. The proofs will be put online at his website, and you can either order them immediately so that you have them to give out at First Communion to visiting relatives or wait and order them with the photos from the actual day. He will also be available the morning of First Communion for photos with relatives who will only be here that day. You can see his work at www.budkeeganimages.com or contact him at 302-743-0626 or [email protected] as well.